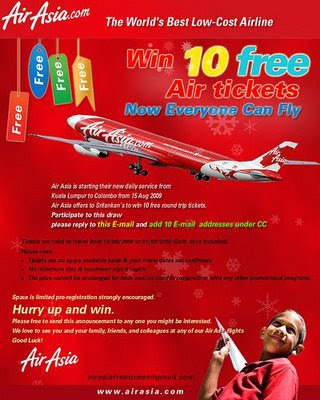 This morning I received an email from one of my very close friends; offering me a chance to win a free air ticket to Kuala Lumpur, sponsored by Airasia. Since AirAsia is the hottest topic in town after Airtel launch in Colombo; it was natural for anyone to read the entire email to see what's on offer. According to this email, all I had to do is just forward this email to 10 of my friends, and copy it to a Gmail address mentioned in the email. The email was very cleverly designed. By the first look at it, no one can ever imagine that it is a prank email. But as soon as you hit to the line “copy to XXXXXXXX@gmail.com” you get the cat out of the bag. It's true that AirAsia is a budget airline. As a low cost operator in their industry, I'm sure AirAsia is looking at all sorts of cost cutting tactics to bring down their overall operational costs, in order to maintain lower airfare to their customers. 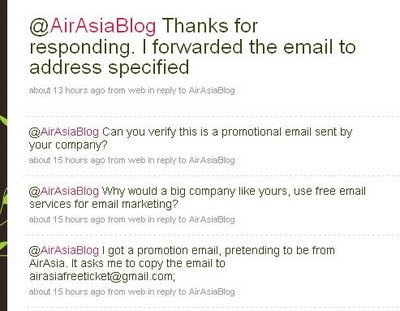 But what can AirAsia save, by using free Gmail accounts for their marketing campaigns? AirAsia already owns www.airasia.com domain, and it doesn't cost them at least an additional cent to create XXXXXXXX@airasia.com for this particular marketing campaign; if it was a genuine campaign. Why would such a reputed company use a free Gmail account for their marketing campaigns? Being the type of a “inquisitive” guy; I immediately turned to AirAsia's website for finding an email to forward this and ask for explanations. But for my surprise; AirAsia is not directly reachable via email! Not a single contact email address was published on their website. (Being close to the customer, huh?). Not being successful to find and email to contact them, I resorted to Twitter for contacting them. Great! Now that AirAsia officially accepting the fact that this email is not sent out by them, I immediately reply the friend who forwarded me the mail, telling him that this is a prank email. Then I forwarded the prank mail to the address they specified me in the Twitter message. So far I haven't received any response from them about the mail, but I'm closely watching their reaction. Would they come out and tell the world on their blog that “this is a prank email” ? Or, would they just keep quiet and enjoy the free publicity they are gaining out of this, like AirTel did with the free iPhone story? What's the learning point to take out of this incident? This AirAsia free ticket deal is a prank, making it's circles all over Sri Lanka. The same thing happened with, now famous “Airtel Launch in Sri Lanka” prank email which went for a good amount of cycles all over the country. Most of the Internet users in Sri Lanka are not aware of organized prank emails. But, this is a common phenomenon experienced regularly by Internet users in other countries. Nokia give away free phones, Bill Gates give away one dollar per email forward, are few such scams to remember. Not a difficult question! They want to “harvest” your email address book. Unprofessional email marketing companies use this type of cheap tactics to build their email marketing lists. Later, they re-sell these email lists to other companies to send you promotional email.s You might think “It's not a big deal for me to receive an occasional promotional email from someone”. But, if you ask any of the American citizen, they will tell you how these “occasional” emails could suddenly become floods of spam emails, promoting you Viagra pills or cheap Replica watches. Prank emails are not the only method used by spam list collectors to harvest your email. They use sophisticated web extractor tools, to collect email addresses you publicly leave on other websites on the internee (Eg: on discussion forums, Yahoo groups etc). If you want to avoid these web extractor tools, and publish your email; use a little tactic like the one I used to publish my contact email in the “About me” section on this blog. Next time if you receive an “unbelievable offer” from someone you know; take few seconds before you hit the forward button like a brainless machine. You can do a great favor to all your friends, and to this budding email marketing industry in Sri Lanka, by discouraging this type of scammers. Educate your friends about this, by forwarding this post to those who may concern.